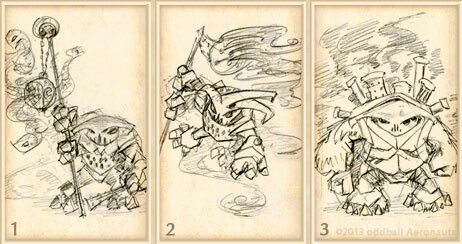 Here presented to you are three variants of an idea for a Pendragon crew card. The basic idea is for a special gadget carried by an Armoured Fiend, in this case a Dark Maker. ‘Armoured Fiends just got deviously dark with this rediscovered classic: the Dark Maker. We all know Fiends love the dark and Shadow Fiends live for it. Well now you can envelop your foes in shadow with the Dark Maker. It literally manufactures a mist of heavy Darkness that billows out and spreads like grasping fingers to cover your Fiends’ approach and makes it hard for your enemy to draw fire against you because, well, where are you exactly? Which one should I take further – which idea do you like best? Your vote will decide which of these ideas will find its way into the final game (the pose may change, it is the idea that’s important at this point). Write the name and number of the idea you like best on a postcard and then in the comments of the original post – such as on our oddball Aeronauts Facebook page – to be counted. These votes will be collected from all our postings across the net and will determine the idea that will be taken to colour and card. Voting is open for one week. Please share the facebook post with interested friends. © 2005-2015 maverick muse ltd.
maverick muse and the m:m logo are TM of maverick muse ltd. All rights reserved.